I am not even sure what day this was, never mind what year. If I had to guess, I would say sometime in August around 1995. My husband and I went to the beach in Rhode Island. This is our favorite day trip. We have our favorite beach – not fancy, but also not too crowded. And I especially like it because it has a decent bathroom. It’s a long drive from northwest Connecticut, so we hardly ever get there before noon. So a beach day for us is really a beach afternoon. But most afternoons there are perfect. My husband likes to lay in the sun. He doesn’t read, or walk on the beach, or swim in the water. He just likes to lie there. Absorbing. I also like to feel the sun on my skin. But I also like to read and walk and swim. Luckily, I don’t have to worry about my valuables left unattended on the blanket, because my husband is always there. Absorbing. When he opens his eyes, he likes to watch scantily clad women. I don’t particularly mind. This is a family beach, not Rio. Most of the ladies look like me. Although the teenagers mostly look great. And they don’t seem to mind being looked at. Let him look, I say. He also likes to feed the seagulls. Some of our beach neighbors are usually not happy about this. But we like to make friends with the seagulls. They like potato chips. I also like potato chips. My favorite beach lunch is a peanut butter and jelly sandwich and potato chips. That tastes so marvelous on the beach, I can’t even describe it. And for dessert – a peach. And that’s what I had that day – so that was part of what made that day so perfect. But what made that day absolutely perfect was the drive home. It’s such a long way, and after all that sun we are usually pretty tired and the drive seems unending. We have a nice rural route to get back to the highway. It’s a winding road that meanders all over. But there’s not much traffic, so you can make some decent time even with the twists and turns. And as we were heading back on this road, and discussing the general state of bathing suits, we passed a farm. And from the driveway of this farm came a goat. This goat began to chase the car. We watched and laughed as he ran behind the car. Then – just when we thought he had given up – he turned it on. He kicked up his heels and suddenly he was running alongside our car. Keeping up with us. Effortlessly. With that big goofy goat-smile. And then he turned it up another notch. He sped past the car like we were standing still.That goat could FLY! He veered off at the next driveway and he was out of sight. That goat was having his perfect day too. All these many years later, we would never think about going to the beach by any other route. And we keep an eye out for goats. Beaches are great and I’ve been to many of them on three continents! Sounds like the goat made your day and I’m not KIDDING. Ha! Every single time we go down that road now, we laugh – remembering that crazy goat. we used to live next door to goats, they are wonderful creatures! What a great day you had! My husband would like to have goats, but I remember an acquaintance who had a goat said that a very well behaved goat is akin to a very bad dog. Thanks! 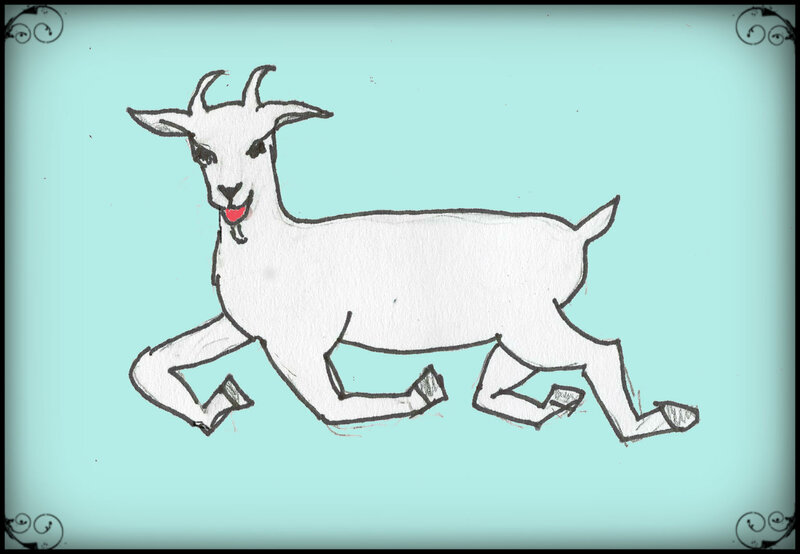 That was my first attempt at a goat! Sounds like a perfect day. No clocks. No phones. No interruptions. Neither did we! He left us in the dust! I love the goat illustration! Goats are so full of personality, you never know when one will turn up and give you a run for your money! Glad you shared the story. Thanks. To me, goats always seem so happy. Cute story; amazing what can make a day so special! I agree – it’s usually something small that you look at in a whole new way! Goats are just…….different. Meet one up close, and you’ll know, or, get chased by one! We definitely got chased by one. But we weren’t much of a challenge. Loved the goat story, but even more important is knowing the beach has a decent bathroom. Two thumbs on that one !! And, hey. I am a goat – Capricorn. I like to kick up my heels once in awhile even if my “run fast” days are behind me. Bathrooms at the beach are essential to my enjoyment. And it looks like all goats like to kick up their heels! He should have had a cape. He was Super-Goat! That goat must have thought he was a dog! We have a few dogs that waylay cars (on the main North-South road in our county), two Great Pyrenees in one area. It’s kind of scary because they jump at the cars doing 55 mph – still, they somehow survive. I don’t mind if he looks. I even gave him my blessing to go see Jello-wrestling once. I just told him not to come home sticky. I love the favorite day posts. They’re so happy-making. My week feels a lot better writing about these happy memories. That does sound like a perfect day. With all that sun and warmth it was certainly a welcome read today. And who doesn’t love a magical goat that can fly? That was the best goat I have ever seen! It was definitely the best goat I have ever heard of! Young girls in bikinis always look good. I forget when their mothers started looking good, too, but it happened. Oh, you give me HOPE! One of my daughter-in-laws just had a birthday and a miniature goat was a guest at the birthday. That goat was the hit of the party. Who knew. Sounds like goats are wonders.